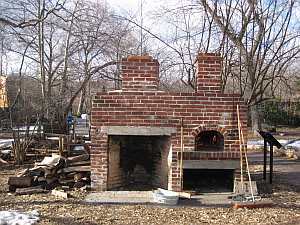 Lefferts House Oven. Prospect Park, Brooklyn, NY. February 19/20, 2011. Somehow the guest baker project went international, and I found myself in a park in Brooklyn, New York. One day last fall Jutta Mason came across an oven while riding around Prospect Park on her bike (it is bigger than our High Park). 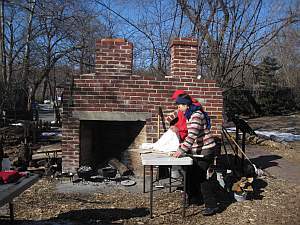 Anna Bekerman, a long time baker at Dufferin Grove who is in Brooklyn at the moment, visited Lefferts Historic House to which the oven belonged and together with the staff there, planned a baking day. I took an overnight bus to join them. Anna, her little baby Alice and I met Elyse, Billy and Margaret on a windy Saturday afternoon to preheat the oven. The oven comes with two parts: a baking chamber and a hearth fireplace, next to each other. Just the sight of it excited me. While the fire was on, we sat in the kids’ room of the house and exchanged our knowledge and experiences. Lefferts House runs educational programs on the way of life of both natives and early settlers in the area. For Billy and Elyse, food is at the center of education, and so the oven was built. School groups and visitors learn how lives were lived there in the early days from the gardens (including grains and flax for fiber! 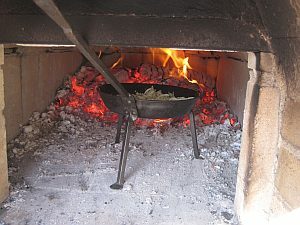 ), the oven, hearth and other cooking equipment, as well as from the museum inside. The fire burned for three hours or so while we talked. Although the walls didn’t burn white, we called it a day and left some coals in the back. Thankfully, by Sunday morning the wind had died down and the sun shone from the sparkling blue sky. The fire was lit at 9 am, and we started prepping. White pizza with sautéed onions, garlic and rosemary. 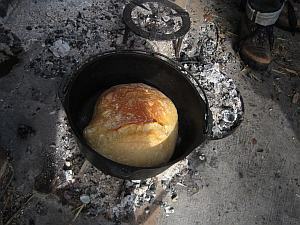 We each brought the bread dough we had made the night before and set it to rise in a warm room. 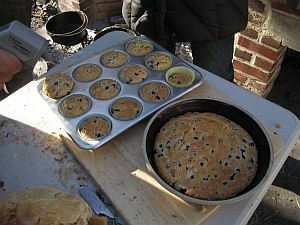 While pizza dough, toppings and muffin batter were prepared, another fire was started at the hearth fireplace. This feature looks nice as it is, but of course becomes more exciting when used. It adds a whole lot more food possibilities, it is basically an oven with stove top functions. 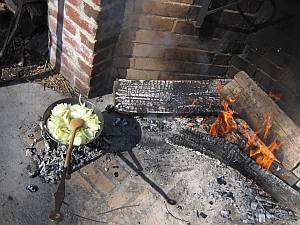 There is an iron hook (called a crane) to hang a cauldron over the fire, and once you have a good amount of coals, you can bring some of them to the front and do some stewing, frying, grilling and barbecuing. While sautéing onions with one of the cast iron pans with legs (called a spider), my imagination went far. With this oven and hearth combination, you could make and serve soup and bread, curry and naan, stew and roasted potatoes, boiled or grilled corn on the cob (try grilling with some soy sauce brushed on them) while beans are slowly baked, tomatoes cooked down in the residual heat in the oven for tomorrow’s use. Ok, back to today. By 11:30 am, the walls of the oven were mostly white. 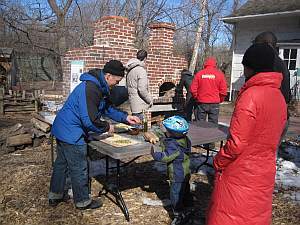 We put a couple of tables out to make pizza, and around noon when the museum opened, some visitors wandered up. There weren’t many dough balls, but just enough for them to make pizza. A little girl was happier to make pizza than to eat it, which worked out well because everyone enjoyed her pizza. It was then when I realized that I had put sugar in the dough instead of salt. This is why I shouldn’t work at a restaurant. It was actually tasty with salty sautéed onion, garlic and fresh rosemary on top, but I was also very hungry. 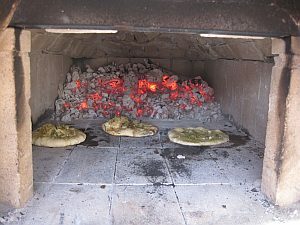 During the pizza feast, sourdough was formed and Dutch ovens for no-knead bread were heating up over coals. Around 1:30, they all went in the oven except for one of the no-knead loaves that Elyse decided to bake with coals from the hearth. It turned out that the floor of the oven wasn’t too hot, especially at the back. So I pulled the loaves in the back to the front, and they baked a little longer. My guess is that hot coals didn’t have direct contact with the hearth at the back (the part that did contact the hearth was buried, which means no oxygen, means cold). A good lesson learned: when baking bread after making pizza, the coals must be stirred well and spread over the hearth for a little while so that the whole hearth gets hot again. Only then should you clear out the coals, let the oven rest and take its temperature in preparation for the bread. But, luckily for us, it was hot enough to bake all the loaves. Again, we got some visitors just when we were pulling out the bread. People gathered, eager to try a piece. One thing we all forgot to bring was a serrated knife. We tried cutting loaves into slices with an old-fashioned curbed knife, but soon gave up and tore with our hands. 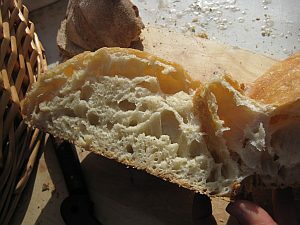 The no-knead bread came out with a bright golden crust, and elastic crumb with big shiny holes. It had a flavour of steamed bread that my mother would occasionally make back home in Japan. I suspected that yeasty flavour might stay stronger when steamed. Both breads were so delicious that it was hard to stop eating. The last to go in were the blueberry muffins. By then the oven had cooled down to about 300, and lower on the hearth. A big mouth of the oven probably means fast heat loss, and the door did not seal well. Elyse had a laser thermometer that could detect surface temperature, which we used to take the temperature of our cheeks but also of the oven. The walls were hotter than the hearth. If we had had more stuff to bake, we could have put coals and fire from the fireplace back in the oven. It’s nice that the fireplace could act as a reservoir of coals for the oven. It was a great baking day. The weather was perfect (my past baking gigs were mostly very cold), and it was satisfying that we made a variety of things. However beautiful the process is, working with wood-fired ovens takes time. You want to utilize the heat as efficiently as you can, and you feel so content that you want to do it again.